The Spacemaker microwave by GE is a kitchen microwave that is designed to be compact and unobtrusive. Its convenient size allows it to be placed in space-limited areas, such as on a countertop, as long as they are located near wall outlets, making it a very useful kitchen tool. From time to time, however, the microwave display may become stuck, the buttons may not respond or the microwave clock may begin malfunctioning. To correct these issues, a simple reset can be attempted. Spacemaker microwaves can be found in kitchens, dorm rooms, lounges, and other locations. Locate the "Clear/Off" button on the front of the microwave. Hold it down for 3 to 5 seconds until the "LOC" error on the display disappears, or the timer or cooking time on the display resets. If you want to reset the microwave itself (including clock settings) or if the microwave controls don't respond, proceed to Step 2. Carefully pull the microwave away from the wall enough that you can reach the wall outlet. 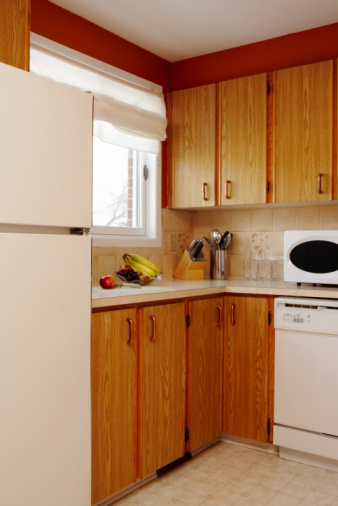 Be sure not to let the microwave hang over the counter or table edge as it can fall. Grasp the power cord at the base of the plug where the plug meets the wall outlet and pull it out of the wall outlet. Wait a minute or two before proceeding. Plug the power cord back into the wall outlet and push the microwave back in place. The display should be blank or blinking "00:00." Press the "Clock" button and enter the current time. Press "Clock" again to set the time and complete the reset. How Does a Tappan Stove Timer Clock Work? Is There a Way to Reset the Compressor on a Window Mounted AC?